Truckers abandoned big-rigs and motorists screamed in fear as they came dangerously close to an explosive wildfire that shut down about 45 miles (72 kilometers) of a major California interstate near the Oregon border that authorities were desperately trying to reopen. The fire erupted Wednesday afternoon in a rural area and devoured timber and brush on both sides of Interstate 5 as it nearly tripled in size overnight, officials said Thursday. It was raging just weeks after a blaze in the Redding area killed eight people and burned some 1,100 homes. The latest fire has blackened 23 square miles (60 square kilometers), prompting mandatory evacuations. It was moving rapidly but was still far from any large towns. Officials from a number of agencies will meet Thursday to determine if they can reopen the highway, a key route for commercial trucks. Officials say they have contained almost half of a Northern California deadly blaze that razed a town and killed at least 63 people. The California Department of Forestry and Fire Protection said Friday the wildfire that destroyed the town of Paradise is now 45 percent contained, up from 40 percent Thursday morning. Assets aiding in the firefighting effort include a Black Hawk helicopter from the California National Guard, conducting water dropping operations on wildfire zones. The department says the blaze has charred 222 square miles (575 square kilometers), destroyed 144 apartment buildings and 9,700 homes. Butte County Sheriff's Kory Honea told reporters Thursday night that 630 people are on a missing list. He said many may be safe, but that he's making the list public so people can let officials know they're safe. More than 450 people are combing through debris in the search for human remains. An onslaught of wildfires across a wide swath of Northern California broke out almost simultaneously then grew exponentially, swallowing up properties from wineries to trailer parks and tearing through both tiny rural towns and urban subdivisions. At least 10 were dead, at least 100 injured and at least 1,500 homes and businesses have been destroyed, authorities said. All three figures were expected to surge in the coming days as more information is reported. Taken as a group, the fires are already among the deadliest in California history. Residents who gathered at emergency shelters and grocery stores said they were shocked by the speed and ferocity of the flames. Some of the largest of the 14 blazes burning over a 200-mile region were in Napa and Sonoma counties, home to dozens of wineries that attract tourists from around the world. They sent smoke as far south as San Francisco, about 60 miles (96 kilometres) away. Sonoma County said it has received more than 100 missing-person reports as family and friends scramble to locate loved ones. Much of the damage was in Santa Rosa, a far larger and more developed city than usually finds itself at the mercy of a wildfire. The city is home to 175,000 residents. Hundreds of homes of all sizes were levelled by flames so hot they melted the glass off of cars and turned aluminum wheels into liquid. "California's motivations for being a leader on climate policy are clear. California has a lot at stake." MUCH AS IT WAS 70 YEARS AGO WHEN A MYSTERIOUS HAZE CALLED "SMOG" SPURRED THE STATE TO REGULATE AIR QUALITY. "What is this pollution that we've heard so much about?" … AND IN 1966, CALIFORNIA ADOPTED THE FIRST VEHICLE EMISSIONS STANDARDS IN THE NATION. ITS AIR QUALITY STANDARDS ARE STILL THE TOUGHEST IN THE U-S.
"There's a certain level of affluence and awareness in places like California. So we're making a concerted effort -- businesses, on a government level and certainly on an environmental level -- to wean ourselves off fossil fuels, and lead the rest of the world, set an example for the rest of the world, for what can be done." GOVERNOR JERRY BROWN RECENTLY PLEDGED TO REDUCE CLIMATE EMISSIONS TO 40 PERCENT BELOW 1990 LEVELS WITHIN THE NEXT 15 YEARS. "The trouble with climate change is it's a 'bad' happening very slowly. And if we don't get it in time, it'll be too late." THAT'S HALFWAY TO THE GOAL SET BY FORMER REPUBLICAN GOVERNOR ARNOLD SCHWARZENEGGER FOR THE YEAR 2050. … AND WHEN LEADERS WANT TO TALK CLIMATE CHANGE, THEY LOOK TO CALIFORNIA. VICE PRESIDENT JOE BIDEN RECENTLY ATTENDED A ROUNDTABLE FOR GREEN START-UPS IN LOS ANGELES. "We're in a position where we have the cheapest energy in the world and will for the remainder of the century and you guys are going to make sure that it's clean energy." CALIFORNIA IS SENDING A DELEGATION TO THE PARIS SUMMIT TO SHARE ITS EXPERTISE. "California has figured out how to grow its GDP while bending down the curve of emissions, and that's part of what's been a really powerful lesson for the rest of the globe." A LEADING ROLE EVEN MORE CRITICAL NOW AS CALIFORNIA ITSELF BEARS THE BRUNT OF GLOBAL WARMING. THE HISTORIC DROUGHT IS PARCHING FARMERS AND LED TO MANDATORY WATER RATIONING STATEWIDE. … BURNING HOMES AND COSTING BILLIONS. "It's really a question of whether you want to get hit in the head by a hard ball or by a whiffle ball. So we can have a big impact on the future by switching to more sustainable energy sources." A CAUTIONARY TALE CALIFORNIA IS SHARING WITH THE WORLD. 9. File photo of smog in downtown Los Angeles. 10. File photo of smog over downtown Los Angeles. As Colorado's most destructive wildfire in history gets under control, California prepares for what could be a rough summer for wildfires. As AP's Haven Daley reports, one group of elite firefighters is ready to drop from the skies to protect life and property. THIS HIGHLY-TRAINED ELITE GROUP OF FIREFIGHTERS PARACHUTE INTO SOME OF THE MOST CHALLENGING WILDFIRES IN THE COUNTRY. THEY CAN BE AIRBORNE IN MINUTES...AND CAN REACH ANY FIRE LINE IN THE WEST WITHIN A FEW HOURS. PHYSICALLY, IT'S EXTREMELY DEMANDING...AFTER FIGHTING FIRES THE SMOKEJUMPERS OFTEN HAVE TO HIKE FOR MILES TO GET PICKED UP. RICO GONZALES IS ONE OF MORE THAN 400 AMERICAN SMOKEJUMPERS. HE HAS MORE THAN 200 JUMPS IN HIS 14-YEAR CAREER. WHEN THEY'RE NOT ON A FIRE...THE JUMPERS SPEND TIME MAINTAINING THEIR FIREFIGHTING EQUIPMENT...LIKE CHAIN SAWS AND HAND TOOLS...WHICH ARE DROPPED ALONG WITH THE JUMPERS. THEY ALSO HAVE TO MAINTAIN AN EVEN MORE IMPORTANT TOOL OF THE TRADE...THEIR PARACHUTES. YOU MAY BE SURPRISED TO FIND OUT THESE TOUGH FIREFIGHTERS ARE ADEPT AT SEWING. AND WHEN THEY'RE NOT WORKING WITH NEEDLE AND THREAD...THEY'RE STICKING NEEDLES INTO EACH OTHER. FIRST AID TRAINING...INCLUDING GIVING EACH OTHER IV'S...IS CRUCIAL IF A FELLOW JUMPER GETS HURT IN THE REMOTE WILDERNESS. BUT IT'S JUST A MATTER OF TIME UNTIL THE JUMPERS WILL BE BACK OUT IN THE FIELD. FIRE AGENCIES ACROSS THE STATE ARE CONDUCTING EXERCISES LIKE THIS ONE IN PREPARATION FOR WHAT COULD BE A ROUGH SUMMER WILDFIRE SEASON. ON-GOING BUDGET CUTS AREN'T HELPING. THE SMOKE JUMPERS WILL COME...AS THEY HAVE FOR MORE THAN 70 YEARS. HAVEN DALEY, ASSOCIATED PRESS, REDDING, CALIFORNIA. "It was amazing how fast it went. And then all of a sudden it jumped the road. We kept putting out spot fires over everywhere. It was raining down ash. The trees across the street exploded." "Having that kind of fire activity at this time of the year in this range, it alarms me, and I've been doing this for a while. So what we're hoping is that citizens pay attention to this. If you haven't created some of that defensible space, you need to do so. It's too late after the fire's coming." Hundreds of firefighters struggled to gain control of a series of wildfires burning across Northern California on Thursday, including a wind-whipped blaze that forced thousands to leave their homes in the Santa Cruz Mountains. The blaze, which started around midday on Wednesday, had grown to nearly 13 square miles (21 square kilometres) and threatened about 1650 buildings. In the Bonny Doon area, about 10 miles (16 kilometres) northwest of Santa Cruz, a wildfire quickly grew to one square mile (1.6 square kilometres) after it broke containment on Wednesday afternoon. It was unclear how many structures had been damaged, fire officials said. 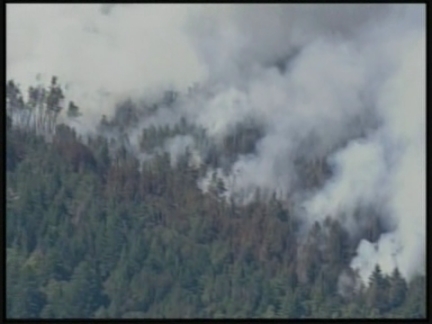 Evacuations were ordered for 500 residents in the heavily forested hills. Voluntary evacuations were in place for another one-thousand residents. Nearly 800 firefighters were battling the blaze, which could spread to as many as 1,500 acres (607 hectares), firefighters said. Authorities also closed all roads to Paradise, a town of about 30-thousand residents about 90 miles (145 kilometres) north of Sacramento. Hot temperatures and tinder-dry vegetation prevailed throughout Northern California, where hundreds of firefighters were deployed on fire lines from the North Coast wine country to the Central Valley. Governor Arnold Schwarzenegger declared a state of emergency in Butte County late on Wednesday to free up additional firefighting resources. He declared another one in Santa Cruz County early on Thursday. Further south, the state's largest wildfire had charred more than 16-thousand acres (6500 hectares) in the Los Padres National Forest and was only 16 percent contained. Wildfires on Tuesday destroyed 32 homes in Stockton, about 50 miles (80 kilometres) south of Sacramento, and 21 homes in Palermo, about 60 miles (97 kilometres) north of the state capital. A small grass fire in Oakland, California burned dangerously close to several structures. According to a driver in the area, there were flames approximately 20 feet (six metres) high along with thick black smoke a couple hundred yards (metres) off the freeway. Thousands of homes remained evacuated today as two massive wildfires raged in tinder-dry California hills and canyons, and authorities said a burned body was found in one neighborhood swept by the flames. Firefighters have been working a fire up and down ridgelines since Friday that has blackened 31-square miles of brush on the edge of Santa Clarita and the Angeles National Forest. 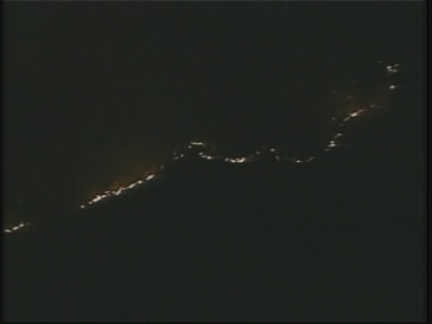 About 300 miles up the coast, crews were battling another blaze across 10-square miles north of the majestic Big Sur region. The body of a man was discovered inside a burned sedan last evening outside a home in Santa Clarita, just north of Los Angeles. There was no evidence the death was crime-related, the Los Angeles County Sheriff's Department said today as the investigation continued. The area was among those ordered evacuated as the fire raged through brush withered by days of 100-degree temperatures as Southern California sweltered through a heat wave. After flames driven by gusty winds swept through an evacuated neighborhood, firefighters reported that some buildings had been engulfed. More than 900 firefighters and water-dropping helicopters battled the flames overnight on several fronts. Despite firefighters' efforts, the blaze destroyed sets at Sable Ranch in Santa Clarita, which has Old West-style buildings used for movie locations. The body of a man was discovered inside a burned sedan last evening outside a home in Santa Clarita, just north of Los Angeles. There was no evidence the death was crime-related, the Los Angeles County Sheriff's Department said today as the investigation continued. "May is not a common time for us to be having this activity. August, September, July we would expect this but not this time of year so we do have reason for concern that this could be an extremely bad fire season." "For those folks that live in the area it is real critical that they assist us with clearing the brush away from their home." "For hours we have seen spraying off the patio cover and everything else and it looks like it's paying off"
Southern California's first wildfire of the season has forced thousands of people from their homes and burned through more than 19-thousand acres of parched grass and scrub. More than 30 structures have been destroyed, including over a dozen homes. Shifting winds pushed the blaze towards homes further north in Corona. Thousands of firefighters are on the lines and about a dozen have been hurt or suffered heat stroke. A drought has left the area tinder-dry, and tens of thousands of acres of trees are dead or dying due to a bark beetle infestation. A man was charged with negligently setting the largest blaze. 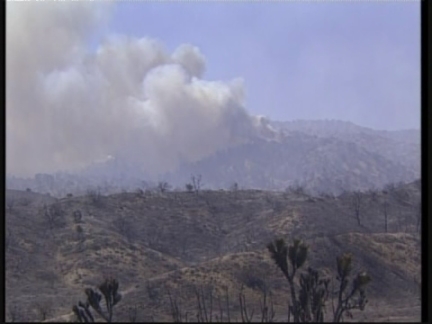 Officials say a ten-thousand-500-acre fire in Riverside County is being fanned by erratic canyon winds. "I want to do everything I can, along with these gentlemen, President Bush, Governor-elect Schwarzenegger, to get money in the hands of people who've suffered losses from these terrible fires, so they can go on with their lives." 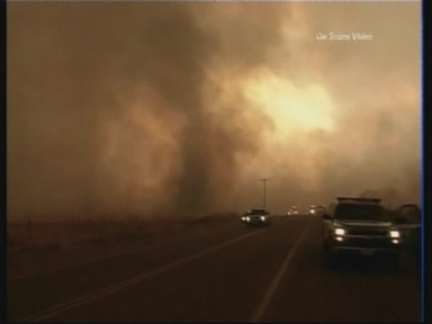 Wildfires in the US state of California continued to rage on Wednesday. So far blazes have spread across 621,000 acres, killing16 people and destroying more than 1,800 homes. Wind-driven flames from the Pico Canyon fire in northern Los Angeles have leapt across the Interstate Five, the only continuous north-south Interstate highway through California. 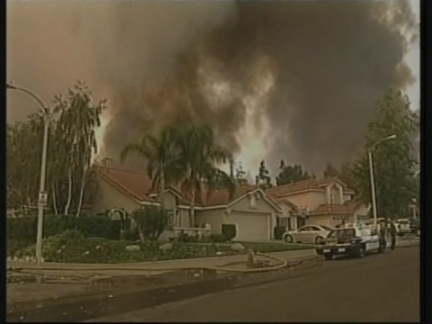 Homes at Stevenson Ranch - a four-thousand-acre planned development - are being evacuated. Flames are as high as 50 feet behind some homes. In San Diego County, firefighters were trying to save the town of Julian on Wednesday. Flames have already destroyed dozens of houses south of the town. 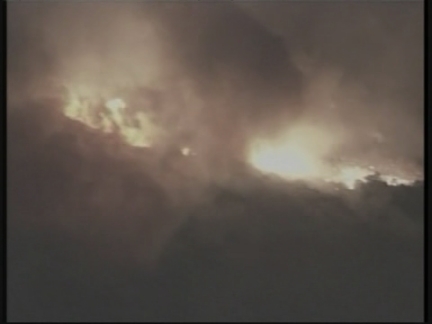 In Santa Clarita, nervous residents watched as flames engulfed the mountains surrounding their homes. A crew from a Los Angeles Television station covering the fire had to be rescued by firefighters after their satellite truck broke down and fire closed in on them. The crew was saved, but the truck was burnt out. The hot wind that has been driving California's most destructive wildfires on record was giving way to cooler, more humid conditions on Wednesday, but that did little to tame the blazes as crews fought to save more homes. Dense morning fog mixed with the heavy smoke hung over San Diego, but an expected change in wind direction was likely to push fires in new, dangerous directions. 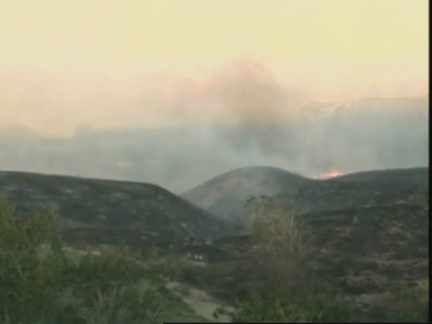 At least 10 fires have burned in a span from northwest of Los Angeles south to the Mexican border. Some were believed to have been started by arsonists. One fire, called the Cedar Fire, was ignited by a lost hunter's signal fire. More than 13,600 firefighters and support crew were on the lines of what may be the costliest disaster California has ever faced. Losses are thought to have amounted to 2 billion (b) US dollars. Firefighters, bulldozers and water tankers guarded homes close to a massive wildfire on Tuesday as officials urged rural residents of Southern California mountain communities to evacuate. Thick smoke darkened the sky as flames rolled through pines and juniper trees on slopes of Los Padres National Forest, where more than 3,500 firefighters battled the fire that started on September 4. No homes were lost to the fire, one of the largest and longest-burning wildfires in state history, burning some 70 miles (113 kilometres) northwest of Los Angeles. Overall, containment was just 43 per cent. Six unoccupied buildings were destroyed, including a modular home, a cabin, barns and trailers, said Dan Bastion, fire spokesman. Wind-whipped flames jumped a road during the day, said Larry Comerford, a US Forest Service fire spokesman. Water- and retardant-dropping helicopters and aircraft attacked the flames from the sky. On the ground, a bulldozer ploughed a firebreak close to where the fires burned and at almost every house there was at least one engine and a few firefighters clearing brush, hosing down roofs and decks. The new fire activity was a surprise setback for firefighters. The blaze that had been moving relatively slowly with the dying of weekend Santa Ana winds that had the potential to greatly spread the flames but it did not. The blaze, which has burned more than 144,880 acres (57,952 hectares) of wilderness, was ignited by someone burning debris. Firefighting costs have topped 41 (m) million US dollars (euro32.3 million). Governor Arnold Schwarzenegger declared a state of emergency for Ventura County. The move cleared the way for government assistance with costs related to the fire. New wildfires erupted Monday in Southern California and chased people from their homes as an intensifying heat wave stretching from the West Coast to New Mexico blistered the region. Towering columns of smoke rose from the San Gabriel Mountains behind Los Angeles as the fires several miles apart devoured hundreds of acres of brush on steep slopes above foothill suburbs. Police in the city of Azusa ordered hundreds of homes evacuated. Helicopters sucked water out of a reservoir to drop on flames while air tankers bombarded the flanks of the fire with retardant. Officials had warned of extreme fire danger in the region as the heat wave peaked. Temperatures surpassed 100 degrees across much of Southern California well before noon, while some desert cities sizzled in the 120s. Authorities in Southern California say two new and surging wildfires in the Los Angeles suburbs are burning away from hundreds of evacuated homes, but a change in winds could bring serious danger. The first of the fires in the Azusa area was sparked by a fatal car crash. Within a few hours Monday, it had grown to over 2 square miles. The second fire began burning just a few miles away in the Duarte area, but it's closer to homes than the first. The cause of the second fire is not yet known. "It's a tragic time for California. The devastating fires have killed so far one person and have injured four firefighters. Maria and I want to join all Californians to extend our thoughts and prayers to the families of those victims." "We haven't been affected, we have great empathy for those who have been, all of the friends that we know and love are okay, but of course your attention is on everybody, I don't know what the answer is, but we've got to do something." "Friends that we hear are having some problems, they're out with their hoses on the roofs and the lawns, but I think it's been miraculous there's been such little loss of life here, it's horrible for the people who have been hurt." "My mother lives in Malibu and we were out in Calabasas yesterday trying to pumpkin pick with our son and the winds were unreal, I mean we got out of there before we even got any pumpkins because the tent seemed to be lifting and we were like, we should go... But my mother lives in Malibu and luckily they're just North of it, but if the winds take a nasty turn who knows what will happen." "A little bit, just because of all the extra traffic and stuff but we're on the other side, on the other side of the hill in Calabasas, so hopefully it won't continue to creep further. I'm just worried about my horses because they're out in Malibu hills, but they're more Canaan, but you never know the winds can shift." Actors John Travolta and Richard Gere, actor-director Melissa Joan Hart and director Alison Eastwood commented Monday (22OCT07) on the wildfires currently ablaze across Southern California, where Tuesday's forecast warned of worsening conditions. President George W. Bush declared a federal emergency for seven Southern California counties, a move that will speed disaster-relief efforts. "We haven't been affected, we have great empathy for those who have been,"John Travolta told AP Entertainment, "all of the friends that we know and love are okay, but of course your attention is on everybody, I don't know what the answer is, but we've got to do something." Richard Gere said "Friends that we hear are having some problems, they're out with their hoses on the roofs and the lawns, but I think it's been miraculous there's been such little loss of life here, it's horrible for the people who have been hurt." Actors Mel Gibson, Kelsey Grammer and Victoria Principal were among the celebrities forced to abandon their homes over the weekend, their publicists said. Actor-director Melissa Joan Hart described her experience: "My mother lives in Malibu and we were out in Calabasas yesterday trying to pumpkin pick with our son and the winds were unreal, I mean we got out of there before we even got any pumpkins because the tent seemed to be lifting and we were like, we should go... But my mother lives in Malibu and luckily they're just North of it, but if the winds take a nasty turn who knows what will happen." The wind-fueled fires that have burned more than 700 homes and chased away 265,000 residents may be only the start of the destruction in Southern California, as Tuesday's forecast warned of hotter temperatures and more explosive gusts. Temperatures across the region were about above average and were expected to approach 100 degrees (37.8 Celsius) Tuesday in Orange and San Diego counties. The blazes bedeviled firefighters as walls of flame whipped from mountain passes to the edges of the state's celebrated coastline, spreading so quickly that even hotels serving as temporary shelters for evacuees had to be evacuated. One person was reported killed; at least 16 firefighters and 25 others were reported injured since the blazes began Sunday. More than 265,000 people were warned to leave their homes in a region that stretched south to the Mexican border. The fires that started Sunday were whipped by ferocious winds, generating walls of flame that bore down on housing developments in a wide swath. Homes burned from the beaches of Malibu to the mountain retreats east of Los Angeles and south through Orange and San Diego counties to Mexico. The winds - which sweep through Southern California's canyons in fall and winter - are stronger than normal, turning already parched scrubland into tinder. The Department of Defense agreed to send six Air Force and Air National Guard water- or retardant-dropping planes Tuesday to aide the massive firefighting effort, after a request by Gov. Arnold Schwarzenegger. Governor Arnold Schwarzenegger has also made 1,500 California National Guardsmen available, and San Diego Mayor Jerry Sanders said the troops' main focus would be to prevent looting and help with evacuations. "It's a tragic time for California," Schwarzenegger said. "If you picture the world ending, this is what it looks like. It just come around the corner - smoke, flames - just fire department, everything. You're thinking, god I hope everybody gets their animals out, everybody gets themselves out. And it was just absolutely.... horrific." "A lot of this fuel has not been burned for a long time. Drought puts a stress on the fuel which causes a lot of downed dead fuel. And so we have this mixture and it's creating a bunch of problems. In addition to that we have a nice, I shouldn't say nice, but we have an extremely hot, dry summer and when you have fuels and weather mixed like that if there's a fire then it really gets erratic and hot." Firefighters continued to battle patches of wildfire burning in rural areas 60 miles (96 kilometres) northeast of Los Angeles on Wednesday. So far, the Crown Fire has burned across more than 10,000 acres (4,047 hectares) after erupting late on Tuesday and raging through the area during the night. About 2,000 firefighters were battling the blaze that was about 25 per cent contained by Wednesday morning. So far officials say the Crown Fire has destroyed a mobile home, an abandoned house and bridge. Meanwhile, firefighters have gained the upper hand on two other large wildfires in the area, allowing weary crews to be transferred to the Crown Fire. The area is thick with thousands of dead juniper and pine trees that were ravaged by six years of drought and an infestation of bark beetles. Winds gusting up to 25 miles per hour (40 kilometres per hour) and temperatures in the high 90s degrees Fahrenheit (32 degrees Celsius) pushed flames past ranch homes between Acton and Palmdale California, about 60 miles (96.56 kilometres) north of downtown Los Angeles. The hot, dry weather has helped spread a series of southern California fires in the past week. Threatened communities have so far avoided the large-scale loss of homes that occurred during wildfires last fall (autumn), but officials warned that the fire season is young. Two new and surging wildfires in the Los Angeles suburbs are burning away from hundreds of evacuated homes, but a change in winds could bring serious danger, according to southern Californian authorities. The first of the fires in the Azusa area was sparked by a fatal car crash. Within a few hours on Monday, it had grown to cover more than two square miles (3.5 square kilometres). The second fire began burning just a few miles (kilometres) away in the Duarte area, but it is closer to homes than the first. The cause of the second fire is not yet known. Offshore winds fanned a large wildfire burning early on Sunday in the Los Padres National Forest in California, prompting voluntary evacuations for portions of Fillmore and a cluster of homes along a highway connecting Santa Paula and Ojai. Since Saturday afternoon, winds have pushed the Day Fire about 16 kilometres (10 miles) west and burned several thousand new acres, authorities said. It has charred an area of more than 323 square kilometres (125 square miles) and was 15 percent contained. The fire was threatening northwest Fillmore - a city of about 14,000 people, 95 kilometres (60 miles) northwest of Los Angeles. Mandatory evacuations have yet to be issued. Winds out of the north and northwest were expected at up to 40 kilometres per hour (25 miles per hour) on Sunday, with stronger gusts below passes and canyons, according to the National Weather Service. More than 1,700 firefighters were assigned to the blaze, which began nearly two weeks ago. How many pages would you like to export to Excel?